With the recent release of the new Apple TV capable of pushing 1080p content, Apple has upped the ante from 720p video content cap to full 1080p in most content that's available to download in HD on iTunes. 1080p content will be downloaded when available by default on both the iPad and the latest Apple TV. However, for reasons unknown, Apple has set iTunes to download HD content in 720p by default with iTunes on Macs and PCs even when 1080p is available for the same content. Whether its purchasing or renting a movie or a TV show, you can now opt to get higher quality 1080p format. But in order to do so, you need to enable the new feature in iTunes. Make sure you've updated to the latest version of iTunes (10.6). 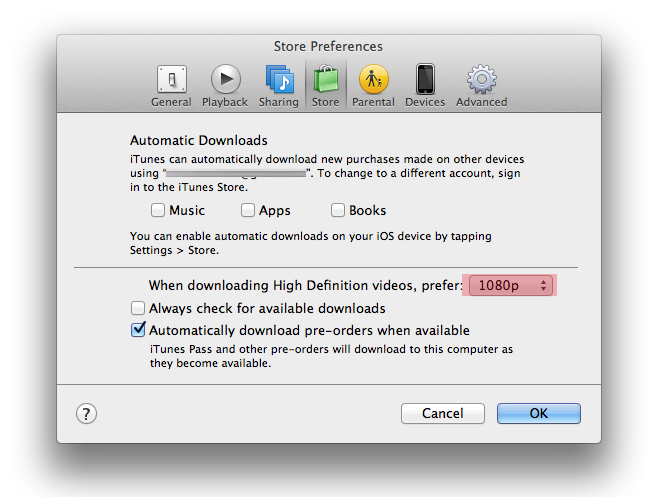 Go to your iTunes preferences, under the "Store" tab switch the default 720p and select 1080p as your prefered download format. After you've enabled 1080p as your preferred download format for HD content, you'll notice that "Downloading 720p" has changed to "Downloading in 1080p" regardless of whether you're renting or purchasing under each movie or TV show that's available to download in full HD. That's just about it. Enjoy! Wi-Fi Syncing. Automatically sync your iPhone, iPad, or iPod touch with iTunes any time they're both on the same Wi-Fi network. Apple is said to be launching its Back to School promotion this week with a big surprised to those who came accustomed to this yearly promotion. Instead of giving away free iPods to students who purchase a qualifying Mac under the educational discount program, this year Apple will swap out the free iPod for a free $100 iTunes gift card. Typically Apple has initiated the Back to School promotion and offered a free iPod with a Mac purchase for students in a strategic move to clear out inventory of iPods and make room for new models which Apple later on announces. If Apple does indeed switch to offering $100 iTunes gift cards to its student in this years Back to School promotion, it will certainly be a letdown for those who planned on scoring a free 8GB iPod Touch 4G which retails for $229. 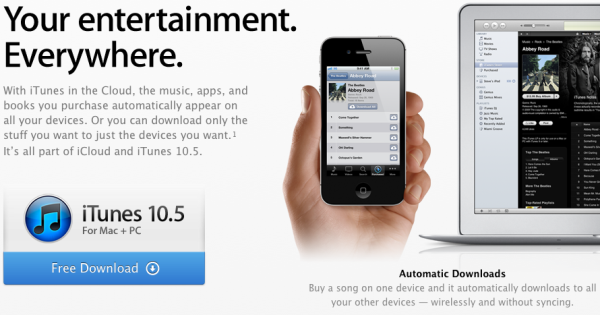 Well, at least you can download $100 worth of music, movies and TV shows on your brand new Mac. Looks like it will be a $100 Apple Gift Card that you will be able to use on the App Store, Mac App Store, iTunes Music and Movies store and will be starting Tomorrow, June 16th 2011 and will be going on till September. Apple has released a beta version of iTunes, iTunes 10.3 featuring iCloud services that have already begun their streaming and syncing wonderness on all iOS devices inside the App Store and even on the iTunes app. 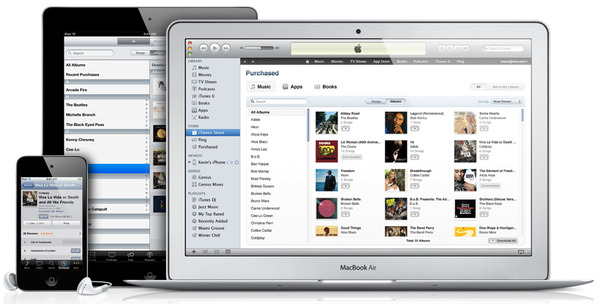 iTunes 10.3 enables you to automatically re-download music, app and book purchases to all your iDevices for free. iTunes lets you access your purchase history and lets you chose whether you want to automatically download content you don't yet have on a certain device or individually. I was able to re-download a few songs on my MacBook Pro that I've purchased over on my MacBook Air flawlessly. The download cloud icon will appear next to a song, app or book when it isn't found on your device and enables you to re-download it, quickly and easily. To get to the "Purchased" section in order to re-download your purchases on any devices wirelessly, you need to to first download iTunes 10.3 to you Mac or PC. Once you've got it up and running, go to the iTunes Store and on the right hand side of the store you will see the "Purchased" link inside the "Quick Links" menu box. 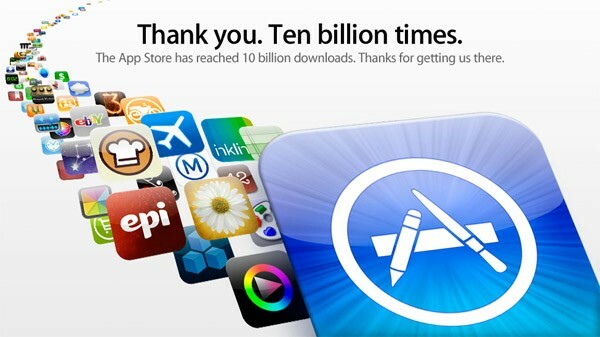 App Store Reaches 10 Billion App Downloads! Today is a day that will go down in history. The App store has reached 10 Billion downloads! This is more apps downloaded than people on this earth! Congratulations Apple, but what is next? 20 Billion? 50 Billion? 100 Billion? I hope we can get a bit of rest before you smash through those barriers. Last week Apple said it expected the new Apple TV to top one million units before Christmas and now they have told us the have. With the addition of AirPlay for wireless streaming content from your Apple devices and how the Apple TV now costs $99 have pushed up the sales of the Apple TV. One million sold in 3 months. Not bad for a hobby. Not bad. Not exactly what I was thinking when Apple said yesterday that "Tomorrow is just another day. That you'll never forget." 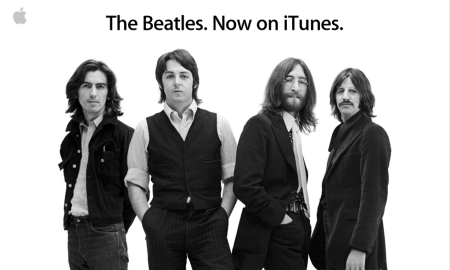 Nevertheless, this is a big thing to Apple's music store as since 2003, one of the world biggest bands was absent from the iTunes store but now you can get all 13 of The Beatles original studio albums from iTunes for a whopping $149!